I have a great recipe to share with you today, the Provencal Summer Vegetable Bake which I found in Family Circle magazine. Yes, I read Family Circle magazine. I love baked vegetable dishes and have made many in the past and I am always experimenting. The Provencal Summer Vegetable Bake caught my eye as it includes a can of cannellini beans as an ingredient and I am always trying to find uses for the cannellini beans I can’t seem to stop buying. This recipe is super easy and lends itself to customization – as in using your preferred herbs, a different mix of veggies or cheese. That said, I made it pretty much as presented here and it was nearly perfect. Heck, put goat cheese on cardboard and I am in. Heat oven to 400 degrees. Peel and halve onions; cut into 1/4-inch-thick slices. Heat 1 tablespoon of the oil in a large sauté pan over medium heat. Add onions and 1/4 teaspoon of the salt. Cook 8 to 10 minutes or until softened. Add garlic and cook 1 minute. Stir in beans, 1/2 teaspoon of the herbes de Provence and 1/8 teaspoon of the pepper. Pour mixture into bottom of a 9 x 13 oven-safe casserole. Meanwhile, cut eggplant, squash, potatoes and tomatoes into 1/4-inch thick slices. (To speed things up, use food processor fitted with a slicing blade.) Toss vegetables with remaining 2 tablespoons olive oil, 1/2 teaspoon salt, 2 teaspoons herbes de Provence and 1/8 teaspoon pepper. Arrange vegetables on top of onion-bean mixture in 1 layer; pack tightly. Cover dish with aluminum foil and bake at 400 degrees for 45 minutes. Remove foil and crumble goat cheese on top. Bake 15 more minutes. Cool slightly and slice into 4 servings. 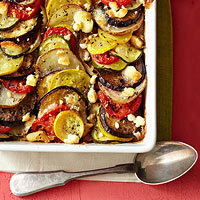 Find the recipe for Provencal Summer Vegetable Bake on the Family Circle website here. You may have to sign-up for a free account, but it is worth it, Family Circle has some great recipes and other helpful content. Visit the Family Circle website here. Lost Cowboy is powered by	WordPress 5.0.4 and delivered to you in 0.904 seconds using 45 queries.